Admit it. You've always admired Mr. Birdy wall art and hippo decanters from afar, but all this time held secret doubts on whether you could pull off "the look" in your own home. Hmm. Well, maybe just a happy coin mug? Do your shopping where Tesshi-e shops: Pesimari, a whims-quirky sundry shop, where an assortment of miscellany can be purchased. Actually getting out the door with your purchase is another matter altogether—to Escape from Pesimari, a plenitude of clever devices and tricks need to be dealt with before you can finish up your shopping and grab a bite to eat. This is Tesshi-e's 92nd escape-the-room game and we're all the richer for it. If you've played the other 91, then you already know how this goes. Point-and-click navigation and interaction, a handy inventory sidebar, and superbly responsive interface makes for pleasant gameplay. Although the cursor is unchanging, it's not difficult to find interactive areas and, mostly, the challenge is a good mix of challenging and logically obvious. If you find yourself stumped, it's either because you walked away from an item before realizing the information it contains or you're trying to decipher letters in boxes (hint: you might have just bit into a red herring). The well-crafted puzzles alone make this a worthwhile venture, but it's also enjoyable to explore this setting, with its pleasing aesthetics, and even more fun when you discover a clue or device because they're so creatively rendered. Because of that ineffable charisma that makes a Mild Escape what it is, you'll leave with a smile and maybe even an extra happy coin for your wallet. Thanks to Cyberjar88 and Celli for sending this one in! Escape from Pesimari Walkthrough now available! By the plant you see an "r" written in the first of four boxes. A sign near the door says A1-Z26. 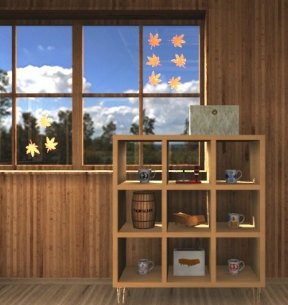 In the corner of one of the window panes is a single maple leaf. On the table is a Mr. Hippo device and a coffee maker. On a chair is an "H" written in the first of four boxes. A ladder under the shelf is secured by a lock. There are more maple leaves stuck to various spots on the window panes. A stand is missing one of three Mr. Birdy picks. A Mr. Birdy glass figurine is missing his hat. The star box seems to need a 4-digit number code. Grab a BLUE CAN of coffee from behind the counter. Read the book and admire the various Mr. Birdy poses. A green book on the counter has an "i" in the last of four boxes. A pink glass Mr. Birdy device has four buttons to press. The maple tree picture is wobbly. The cake display needs a key. Four tiny chairs sit on a tiny stage. Next to the tiny chairs is a round device with 8 buttons on its dial. Along the edge of the low table, below the chairs and round device is a drawer secured by two small screws. Finally, high up on the ceiling beam is a green doll. Note there are more maple leaves in the windows. You can take any MUG CUP you'd like off the shelf, but only one per customer. Inside the MUG CUP is an "M" in the second of four boxes. In the top middle cubby is a hat locked up in a glass case; a 3-digit code is needed. A box on top of the cubbies needs a key. After looking at everything you can readily see, exploring every accessible crevice without solving any puzzles, you're left with many clues and only two items so far: a MUG CUP and a CAN of coffee. You're also ready to solve two puzzles now. Look at the leaves in each of the window panes. Think of each window as divided into two 4x4 segments. Note which corner of those 4x4 segments leaves are located and count the leaves. Use those clues to solve the wobbly picture. Get the PINK MR BIRDY PICK. Note the "o" in the first of four boxes. Look through the green book on the counter and pay attention to where Mr Birdy's eyes are looking. Use those clues to operate the pink birdy device. Unlock the LADDER with the diamond key and take it. Use the LADDER on the green doll that's sitting on the ceiling beam and climb up. and note the "p" in the third of four boxes. Remember that there's a box up here that also needs a key. Go over to the long shelf under the windows and put the PINK Mr BIRDY PICK into the stand between the other two. Note the height of each pick as well as the dots under them. Use those clues to solve the 3-digit number for the encased hat (on the top middle cubby). Look inside the hat to get a SCRATCH CARD. Go over to the low display table and use the SCREWDRIVER on the small screws along the edge. Look at the rows of folded towels, noting number and color. Move aside the blue towels to see a star and get A COIN. Use the COIN you just found to scratch off the SCRATCH CARD. Make a note of the info you see there and turn back to the star box on the long shelf. the -SI- DOLL. Take it. A [period] in the third of four boxes. After solving the star box, you now have all the clues to open Mr.Hippo's mouth. Turn back to the round table by the front door and examine the hippo device. Click each of the four buttons in the correct sequence. and look inside it to get the MATCHES. Pour the CAN OF COFFEE into the top of the brewer. Use the MATCHES the wick at the bottom of the stand. Click the top of the brewer again to put out the fire; a vacuum effect will bring the delicious coffee down into the lower pot. Note the design on the upper glass of the brewer. Light up the correct buttons on this device then click the center button to open the device. Look at how the flower design changed completing the whole coffee brewing process; the white petals represent the buttons you should light up on the compass device. Take the -PE- DOLL from inside the device. Back up from the compass device and zoom in on the four tiny chairs next to it. Note the numbers on the panel. Before exiting, save your game (Function, then SAVE). When done correctly, you'll get a SPADE KEY. Use the SPADE KEY to unlock the cake display and take the happy coin. Now you can walk out the door for the happy coin end! pour themselves a cup of coffee in one of those mugs! 2. Cups are not important at all, coffee is no need to get out too. 6. Pesimari is obvious, then how to hide it for the happy coin by rearrange them? Did you notice that you get to choose your coffee cup for the end scene? Great escape. I just got the inspiration to spell the four syllaber word backwards... but I see no link with the four numbers... something to do with x7 combinations ??? Thank you, my third (and last) neuron ! I thought that was clever, yeah.